Most runners can’t devote their entire lives to running, though we wish we could. Between family obligations, jobs, school and social commitments, getting your training in can be a challenge. We spoke with three busy runners about how they manage their lives with their training, and how to maximize the time you have available. Eric Bang is a Toronto-based runner and marathon coach with years of coaching and racing experience. Bang knows how to maximize training time so that you’re training efficiently, as opposed to just logging a ton of miles. One of the most important aspects of training for a person who’s very busy is to keep it fun–you don’t want your daily runs to feel like a chore. Bang recommends creating an obvious and definable goal as well. This goal will look different for everyone, but understanding exactly what you’re working towards helps with motivation and consistency. Finally, Bang suggests building running into your weekly schedule. “I wake up at the same time on the same days, so keeping things consistent makes it easy to know what’s coming and what my week will look like.” Knowing your training schedule allows you to plan the other aspects of your life. Not having a clear-cut time set aside for your run sets you up for failure. Kate Van Buskirk is a Commonwealth Games medallist and elite track runner. While she isn’t a marathoner herself, she knows what it’s like to have a lot of running to do and not enough hours in the day. Brittany Moran is a Toronto based chiropractor, running coach and marathoner. Finally, Moran reminds runners that recovery is key. 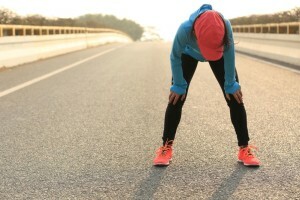 “Honestly, if you don’t have time to fit in recovery, cut the last kilometre of your run and spend that five minutes doing post-run stretching or mobility.” If you spend five to ten minutes on recovery every day it’ll actually save you time in the long run, because injuries can take up more time than the running that caused them.